In case you've been sleeping under a rock with your iPhone turned off, there's some big tech news coming up on Saturday: Apple's iPad goes on sale. And the pundits are already chiming in. Here's a point-by-point about this new "slate" computer, which is like a touch-screen laptop without a keyboard, or, as The New York Times writes, "basically a gigantic iPod Touch." Overall impressions: Most tech reviewers are pretty gaga over the iPad, but there's some variance in how much they love the device. The Chicago Sun-Times is ready for a commitment ceremony, declaring the iPad "pure innovation" and "one of best computers ever." The New York Times isn't as sold. Typing: The iPad doesn't have a keyboard, so you have to tap on the screen the screen to type. NYT says it's "barely usable," plus: "When the very glossy 9.7-inch screen is off, every fingerprint is grossly apparent." Wall Street Journal takes the opposite view: "I found the iPad virtual keyboard more comfortable and accurate to use than the cramped keyboards and touchpads on many netbooks." Better than a laptop? 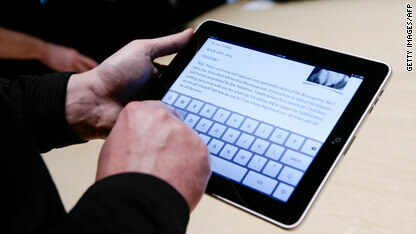 : WSJ says the iPad is "pretty close" to being a laptop killer. Multitasking: You can't run more than one program at once on the iPad, which disappoints the blog Engadget: "There's no multitasking at all. It's a real disappointment. All this power and very little you can do with it at once. No multitasking means no streaming Pandora when you're working in Pages ... It's a real setback for this device." Creating documents: The WSJ likes the virtual keyboard, but doesn't think it will work for all business functions: "If you need to create or edit giant spreadsheets or long documents, or you have elaborate systems for organizing e-mail, or need to perform video chats, the iPad isn't going to cut it as your go-to device." Multimedia books: BoingBoing says colorful, clickable books and apps make the iPad. It highlights those from Marvel Comics, Reuters news agency and the Epicurious recipe site. Color books: USA TODAY says the fact that your can read books in color on the iPad is a big deal. You can't do that on many e-reader competitors: "Judged solely from a sizzle standpoint: There's no contest. Titles on the iPad such as Winnie the Pooh (which comes preloaded on the iPad) boast colorful illustrations. The 6-inch Kindle screen is grayscale." No Flash: The iPad doesn't support Flash video. NYT: "Apple has this thing against Flash, the Web’s most popular video format; says it’s buggy, it’s not secure and depletes the battery. Well, fine, but meanwhile, thousands of Web sites show up with empty white squares on the iPad — places where videos or animations are supposed to play." Cameras: The iPad doesn't have a camera, which means you can't use it for video conferencing. USA TODAY makes another point along these lines: There's no USB connection to hook up the camera you already have. But the paper says there's a workaround: "Some will decry the absence of a USB port or other connectors, which might let you hook up a printer or bolster storage. Everything comes through the standard iPod-like dock connector on the bottom of the iPad. You can purchase a $29 iPad Camera Connection Kit..."
Maps: "Maps become real maps, like the paper ones" on the iPad's larger screen, NYT says. Love factor: Some writers seem to be just downright in love with the device. Scary in love with it. From BoingBoing: "The form just feels good, not too lightweight or heavy, nor too thin or thick. It's sensual. It's tactile ... the iPad hits a completely new pleasure spot." Anything else you want to know about the forthcoming pleasure device known as the iPad? Let us know and we'll do our best to find you answers. Also, if you pick up an iPad on Saturday, let us know what you think at this CNN iReport assignment. Batteria Acer Aspire 5520 Series – Se state cercando la migliore marca nuova batteria Acer Aspire 5520 Series al prezzo più preferito, siete nel posto giusto. Forniamo la batteria Acer Aspire 5520 Series di altissima qualità, il prezzo più basso, migliore servizio. Awesomely done article. I definitely love this site . Keep it up! Very nice blog post . I certainly like this site . Keep writing!